In a small saucepan, melt butter over medium heat until foamy. Add flour and stir until light brown in color. Add onion and seasonings (bay leaf and 1/4 tsp. salt), then whisk in milk, stirring until the mixture comes to a boil and thickens. Reduce the heat and cook for five minutes, then pass through a fine strainer and reserve. The sauce will be very thick. Cook spinach immersed in boiling water for one minute. Remove and refresh in ice water. Squeeze it until it is very dry and then purée it in a food processor. Set aside. 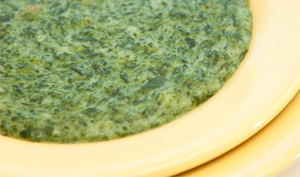 Just before serving, combine the sauce with the puréed spinach and cook on low heat, stirring often, for about 5 minutes. Season to taste with salt and freshly ground black pepper. Finish by stirring in 2 tbsp. of soft butter.